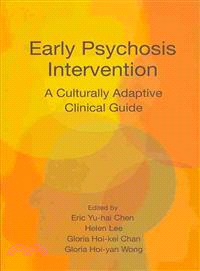 Taking into account cultural differences between Asian and Western patients, this book focuses on delivery of effective treatment at an early stage in psychosis, especially for young people. It pays particular attention to early intervention programmes established in Hong Kong and Singapore, and assesses recent developments in Korea, Japan and other countries. The volume covers approaches in the management of psychosis, including pathway to care, stigma and interventions. With reference to the experiences of frontline practitioners, research findings and theories, it highlights the practical needs in non-Western healthcare settings. Culturally relevant discussions on recovery, relapse, self-harm and comorbid substance abuse are discussed. It also covers case studies to illustrate challenges and strategies in managing early psychosis. Eric Yu-hai Chen is a professor in the Department of Psychiatry, Li Ka Shing Faculty of Medicine, the University of Hong Kong. Helen Lee is a principal case manager and team leader in the Early Psychosis Intervention Programme at the Institute of Mental Health, Singapore. Gloria Hoi-kei Chan is a case intervention officer in the Department of Psychiatry, Li Ka Shing Faculty of Medicine, the University of Hong Kong. Gloria Hoi-yan Wong is a postdoctoral fellow in the Department of Psychiatry, Li Ka Shing Faculty of Medicine, the University of Hong Kong. "A lucid and sensitive account of how Western early intervention models for psychosis can be adapted to different cultural settings. Richly illustrated by real-life clinical insights based on a decade of experience. Essential reading for those caring for psychosis patients in non-Western locations as well as in multicultural settings in the West." "From East Asian cultural settings known for high levels of stigmatization of severe mental illness comes perhaps the single most important work on early psychosis and its treatment in the past decade. This book, filled with hard-learned lessons from clinical practice, program development, and implementation research, provides models critical for the global mental health movement worldwide. An inspiration!"